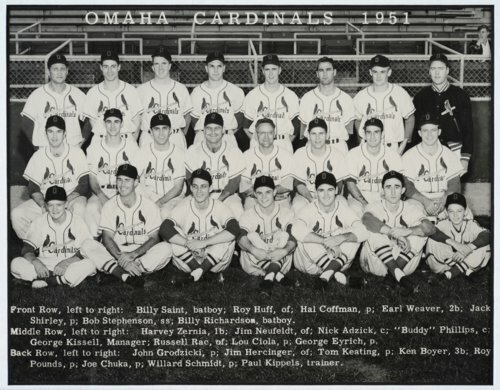 This is a photograph of the 1951 Omaha Cardinals, a minor league baseball team in the Class A Western League. Among those pictured are Kansans Harland Coffman, of Topeka, and Willard Schmidt, a native of Hays. Both were pitchers. The Cardinals won the Western League pennant in 1951, with a record of 90-64. Coffman made pitching appearances in 26 of the team's games, earning 11 wins against 7 losses. His ERA was 2.96. Schmidt's record that year was 19-14 and an ERA of 2.11. Harland Coffman pitched for several minor league teams between 1948 and 1952. In 158 minor league games, he achieved an overall record of 62-46, with an ERA of 3.19. In 1952, he participated in the St. Louis Cardinals' spring training camp, but did not make the team roster in the regular season. Willard Schmidt pitched in the majors for seven seasons between 1952 and 1959. In 194 games for the St. Louis Cardinals and Cincinnati Reds, Schmidt won 31 games and lost 29. All of the players included in the photograph are identified in the caption. Two of them would have long, distinguished major league careers, including Hall of Fame manager Earl Weaver and third baseman Ken Boyer. Digital reproduction of the photograph was accomplished through a joint project sponsored by the Kansas Historical Society and the Shawnee County Baseball Hall of Fame.